A session of steam is an integral part of healing and wellness throughout the world. Hot water bags and hot showers form an indispensable part of personal care. Heat is used in different forms like Hamam (Turkish bath), Thermae (Roman bath), Banya (Russian Sauna) hot stone massages, Thailand and so on in different ancient systems of medicines and home remedies. Lately steam is becoming popular again for its important health benefits. 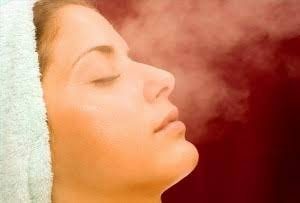 Steam is applied in various forms in Ayurveda. Sitting in a room filled with aromatic steam, streaming steam via tubes to specific parts, hot packs (for localised pain and inflammation), hot pouches (called Pinda sweda), are few popular forms. Steam therapy is successfully used in Ayurveda to address osteoarthritis, rheumatoid arthritis, gout, joint effusions, plantar fasciitis, calcaneal spur, cervical spondylosis, lumbar spondylosis, frozen shoulder, low back pain, sore muscles, disc bulge, numbness, restless leg syndrome, sensitivities and other nervous disorders, asthma, sinusitis, allergy, cellulite, weight gain, feeling down, feeling heavy, poor digestion, anxiety, depression, post natal care and so on. A session of steam leaves you light and easy with relaxed mind, clear skin and relaxed muscles. A session of hot oil massage (Abhyanga) before steam boosts the effects of steam. Along with other therapies, a session of steam can be added just for $20.